Portrait: Gerlinde Zickler, born 27.9.1944 married with one daughter 2 granddaughters resident of Tulln since 1978 . 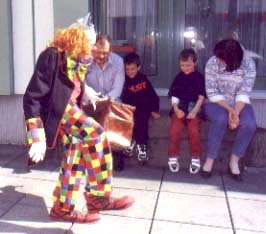 Every Monday at 3 pm little patients wait excitedly for Clown Tschitscho at the children's ward of Tulln Hospital. 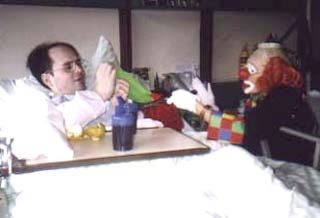 "Look, a clown, a real clown! Can you do magic? What have you got in your bag?" More and more children are joining the crowd. Tschitscho is so small and has got enormous feet. Her nose is nearly bigger than his face. She can blow bubbles as big as a football. As a child, Tschitscho was very ill as well. At the age of 1 ½ she was taken to Stolzalpe and had to spend 29 months in a plaster cast bed. Since then she has had to live with a physical handicap. 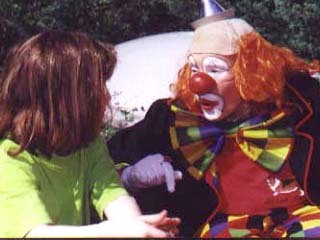 But a clown can be big or small, ugly or beautiful, straight or hunchbacked. 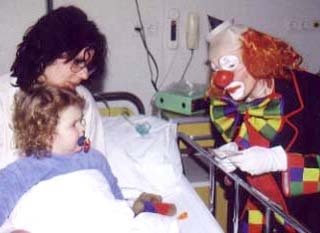 There's nothing more rewarding than to cheer up sick children. Painting is Mrs Zickler's favourite hobby. Many of her pictures can soon be studied in a book. > "Tritt ein - fühl Dich wie daheim" < (Magazine published by: NÖ Landes- Pensionisten- und Pflegeheim Tulln/Donau). It is not the perfect body that makes people great. It is the actions of our heart that make us grow. Tulln artist Gerlinde Zickler knows how to tackle life. She was born in 1944 at Zams (Tyrol). 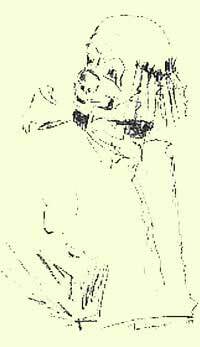 Hardly a year later, she was struck by tuberculosis of the bone. 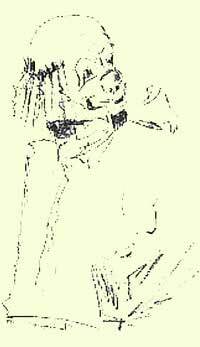 A long way of suffering with numerous stays at hospitals and sanatoria did not render that poor girl desperate, and neither did the wearing of a corset made of leather and metal. Soon she discovered her artistic talent. 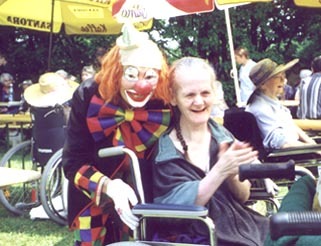 Since October 1999 she has been making our residents laugh by her weekly appearance as Clown Tschitscho. She got married, had a daughter and moved to Tulln in 1978. For six years Gerlinde Zickler has been chairperson of an association called 'Miteinander Leben' (Living Together). She devotes herself to the construction of a home for mentally and physically handicapped people.